Pour the strawberry schnapps into a shot glass. Layer the Irish cream on top. 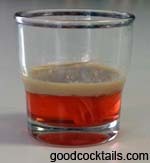 Finally, add the drops of grenadine to the center of the drink. The grenadine has to pass through the Irish cream. You might have to add more than 2 drops of grenadine.